George Achniotis has been Navios Holdings’ Chief Financial Officer since April 12, 2007. Prior to being appointed Chief Financial Officer of Navios Holdings, Mr. Achniotis served as Senior Vice President-Business Development of Navios Holdings from August 2006 to April 2007. Before joining Navios Holdings, Mr. Achniotis was a partner at PricewaterhouseCoopers in Greece, heading the Piraeus office and the firm’s shipping practice. He became a partner at PwC in 1999 when he set up and headed the firm’s internal audit services department from which all SOX implementation and consultation projects were performed. Mr. Achniotis is currently a Director and Executive Vice President-Business Development of Navios Partners; a New York Stock Exchange traded limited partnership, which is an affiliate of Navios Holdings. 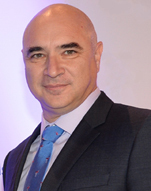 He has more than 19 years’ experience in the accounting profession with work experience in England, Cyprus and Greece. Mr. Achniotis qualified as a Chartered Accountant in England and Wales in 1991, and holds a Bachelor’s degree in Civil Engineering from the University of Manchester.